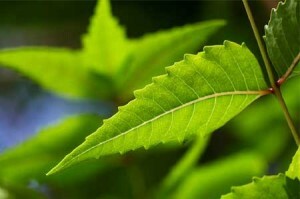 One of the cornerstones of ayurvedic remedies for acne and pimple is the neem leaf. Known for its powerful antibacterial property, this leaf has been used in many forms to relieve the skin from infections, rashes, pimples and acne. Besides the leaf, other parts of the neem tree have also been for therapeutic purposes against various skin, hair and even teeth issues. Focusing on the neem leaf, we discover its effective role in eradicating any type of acne, blemishes, whiteheads and blackheads. You can make simple concoctions and combinations in your kitchen to reap the many benefits of the neem leaf. What Makes Neem Leaves So Effective? Neem leaves combine antiseptic, antiviral, antifungal, astringent, antioxidant and anti-inflammatory properties to create a holistic remedy against acne and pimples. The antioxidant property of the neem leaf is believed to be a hundred times more powerful than broccoli, blue berry and other foods that are antioxidant in nature. As a result, neem neutralizes free radicals and boosts the immune system. When applied on the hair or skin, as a result, neem rejuvenates, vitalizes and repairs any existing damage. It is also effective in delaying the formation of age spots and wrinkles. When consumed, neem leaves also purify the blood and provide radiance to the skin. Neem leaves contain a power ingredient known as quercetin which is the primary reason for its effect on acne and pimples. Quercetin reduces acne induced problems like inflammation and redness and keeps the skin soothed and cool. In addition to quercetin, neem also contains salicylic acid that is a powerful anti bacterial, preventing any break out or skin infection. Oil extracts from neem have effective nourishing properties because of their fat content and hydrating components. Because of these active elements, neem is one of the most important ayurvedic remedies against skin problems. Neem and Multani Mitti Pack: This is a face pack that you can make at home easily. With regular use, you will notice that the breakouts and pimples reduce to a great extent. 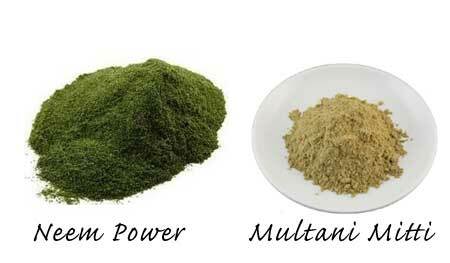 Also, the inclusion of Multani mitti keeps the skin cool and supple. You will also notice that this pack reduces dark spots and improves the complexion. To make the pack, dry a few neem leaves in the sun until they become crisp. Grind these leaves into a fine powder. To one teaspoon of this powder, add multani mitti and make a thick paste using rose water. Apply this paste on the face and neck and leave it on for about 20 minutes and then rinse it off with water. 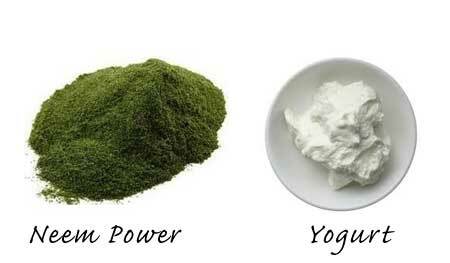 Neem and Yogurt Pack: Neem in combination with yogurt is very effective in maintaining smooth and clear skin. While the yogurt moisturizes the skin and relieves dryness and dullness, neem acts as a powerful antibacterial that reduces acne and pimples and also removes dark spots. To make the pack, dry neem leaves in the sun and grind them into a fine powder. To 2 teaspoons of this powder, add one teaspoon of besan. Mix them well and make a smooth paste using only yogurt. Apply this paste evenly on the skin and neck and leave it on for 20 minutes. Once it is dry, wash it off with water. You must repeat this process at least twice a week to see best results. Overnight Acne and Pimple Cure: When you feel an acne or pimple bump on your skin, neem can act as a great overnight remedy. All you need to do is prepare neem powder using the leaves. Make a paste with rosewater and just apply on the infected area and leave it overnight. You will notice that the bump has been reduced completely. Repeating this 2-3 times will cure the breakout completely. For overall protection for your skin, make sure you include neem in your bath every day. You can either boil neem leaves in water and mix the residue with your bathing water or you can just allow a few leaves to soak in your bathing water for a few minutes.